The Vancouver Island Pagan Pride Day is an annual event held at various locations throughout Vancouver Island. 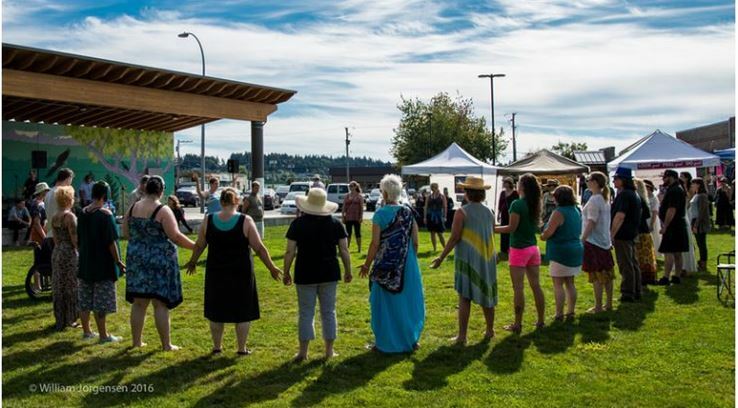 Previous events have been held at Kin Park on the beautiful Departure Bay Beach in Nanaimo,Lewis Park in Courtenay and most recently at the Sooke Region Museum. The day is full of musical entertainment, speakers from around the province, demonstrations, workshops, vendor tables full of Pagan and Pagan friendly goods and services as well as great food! The general public is invited and there are usually tables of reading materials, staffed by members of a range of Neopagan denominations. Speakers may focus on dispelling common misconceptions about Neopaganism, or they may seek to educate outsiders about the details of their particular beliefs and practices. Pagan Pride Day has served to connect and educate people since the first event was held in 2005. This has facilitated the tremendous growth of our community. What was once a small gathering of like-minded people has blossomed into an annual festival offering a variety of entertainment, education, demonstrations, and vendors. It has become a place to gather as a community and celebrate. This event has allowed many to access information about Paganism as a religion and as a way of life in a safe environment. The next planning meeting would be June 24th, 2018… this in an informal get together… Just to discuss progress and such. If you would like to attend please feel free! We always need more help on the day as well… Just let yourself be known to the main tent on the day! Brew Ha Ha (planning meeting) is at Serious Coffee in Esquimalt Plaza currently at 1:00 on the 24th. Looking forward to hearing from you!